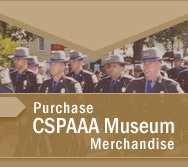 The mission of the Connecticut State Police Museum and Educational Center is to display the rich history of the Connecticut State Police Department through displays, photos and videotapes. This museum will trace the history of the Connecticut State Police Department through its inception in 1903, with only a handful of troopers, to today’s modern state police department that is staffed with over 1,400 sworn state troopers and dedicated civilian support personnel. The museum will also trace the history of law enforcement from its early days in Connecticut to the present time. It is our hope the make this museum a center of learning regarding the history of Connecticut law enforcement for people of all ages.